Get your training partner to wrap the voodoo compression band high up the arm as possible into the armpit. 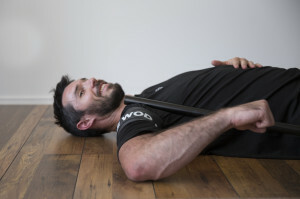 Lye down on the floor, have your partner push down on your shoulder or place a barbell/kettlebell across the front of the shoulder. Then either slowly rotate your arm into internal and external rotation or have your partner rotate the arm back and forth. I suggest if doing this with a partner always go first then you know how much pain to cause them.